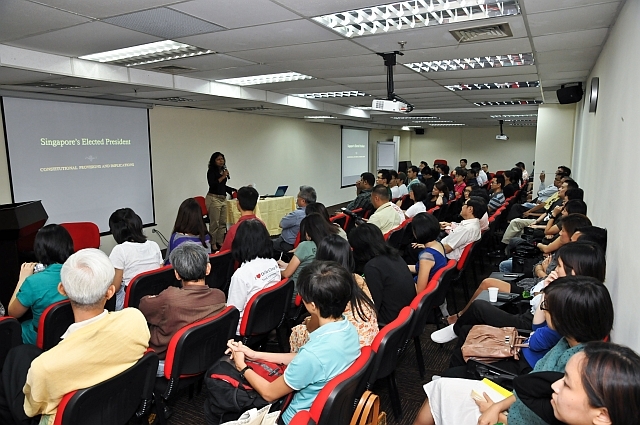 The forum, organised by Singapore human rights Non-Governmental Organisation (NGO), MARUAH (Working Group for an ASEAN Human Rights Mechanism, Singapore) aimed to provide clarity on the role of the Elected Presidency before citizens go to the polls on 27th of August 2011 to vote for a new president. 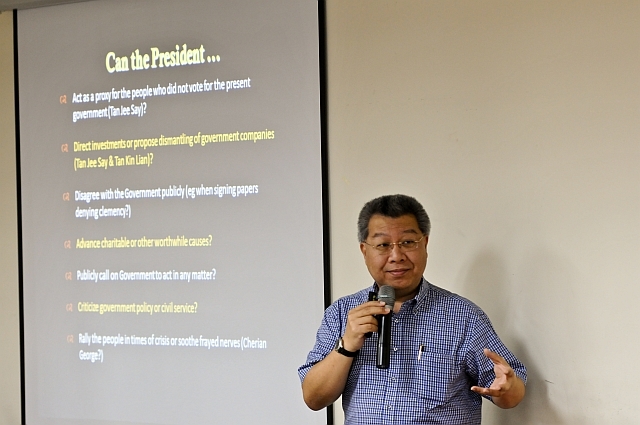 Dr Kevin YL Tan, one of Singapore’s constitutional law experts, gave a concise review of the role of the president, culminating in a list of possible grey areas arising from the said presidential functions within the Constitution. Next, Mr Alex Au, blogger at Yawning Bread, analysed 2011 – the year of watershed elections and what could possibly be on the other side. These discussions were moderated by Ms Braema Mathi, President of MARUAH, who kicked off the forum by framing the scope of discussion and emphasising the rights-based perspective taken by MARUAH. Dr Kevin YL Tan (Adjunct Professor at the Faculty of Law, National University of Singapore and Adjunct Professor at the S Rajaratnam School of International Studies, Nanyang Technological University) reviewed and presented an analysis of the key constitutional provisions pertaining to the Elected President’s (EP) powers. He highlighted that “the Constitution cannot lay down every single job of the President” and that it cannot work in the absence of common sense either. While he focussed on various provisions within the Constitution, namely Article 21, he also reviewed grey areas facing the EP. Generally, the President must exercise his functions on the advice of the Cabinet or of a Minister acting under the general authority of the Cabinet. In certain cases the President must consult Council of Presidential Advisors (CPA) before exercising discretion. If he does not concur with the recommendations of the CPA, Parliament can override his decision. There is no Parliamentary override if he is not required by the Constitution to consult the CPA. The EP should generally support government policies but in matters of conscience, such as the death penalty, the EP might well publicly disagree with the Cabinet; it is a tough call. The EP cannot openly criticise government policies but what counts as criticism is vague. The EP is generally expected to support charity efforts nationwide but what if the charities are implicitly anti-government in stance? Nonetheless, Dr Tan did make it clear that the EP is not supposed to be surrogate opposition or a proxy for those people who did not vote for the present government. The EP cannot direct investments or dismantle government companies. Furthermore, an “activist” EP can be removed for “intentional violation of the Constitution”. Alternatively, a Government who is fed up with a meddlesome or obstructionist EP may circumvent his scrutiny by amending the law to reduce his powers. Even if the law is not changed, they can find other sources of income (e.g. increasing taxes, selling state assets or granting monopoly/oligopoly of licenses) and thus not need to draw down on the reserves. Dr Tan further mentioned that when the Government first conceived of the scheme, they had only one scenario in mind – the case of a good president controlling a bad government. (c) good president vs good government. In all these cases, gridlock can result. Mr Alex Au continued with this discussion as his lead up point to the premise of his presentation. 2011 has been a year of watershed elections. Like Dr Tan, he agreed that grey areas exist, and it is precisely because there are grey areas that the EP has some flexibility to shape his office. That said, Au argued that much will also depend on the Cabinet’s reaction and public opinion. According to Au, all candidates have acknowledged constitutional limits, but what distinguishes them is what they’re saying about how they would use what influence or moral authority the president will have, even on matters outside the areas where the EP has discretion. Au believes that voters need to know more about each candidate’s overall philosophy and personal principles, because voters are looking to elect someone whose principles resonate with theirs. However, not all candidates have been forthcoming in explaining their grounded beliefs. Due to the constitutional limitations, the president alone will have limited impact as check and balance. Much more will depend on the composition of parliament and an active civil society, but if the EP is conscientious about his duties, he will play a useful role. Check and balance comes ultimately not by a single magic solution, but brick by brick, and the EP can be one. 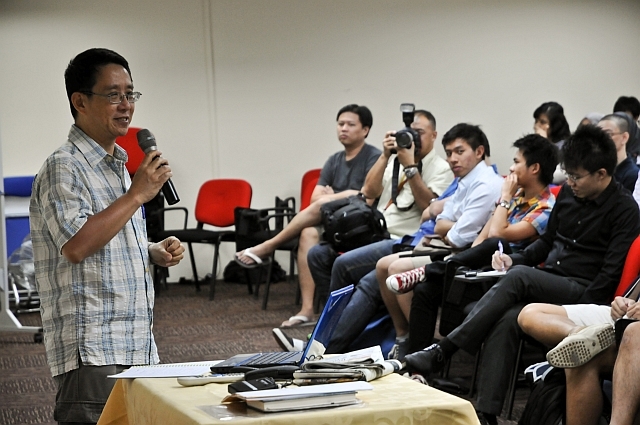 One of the topics that was intensely argued was the criteria to be an EP. Is there a need to be so stringent? Is the $100 million dollar aspect crucial and hold any presidential value? Why can’t we do away with the Presidential Elections Committee (PEC)? The Media Release of PEC was also critiqued for their basis of why the four candidates were selected – because of integrity, good character and good reputation. What constitutes these qualities? And how does one measure it? A member of the audience also asked the speakers of their personal views of the presidential candidates since the speakers have rubbed shoulders with a few if not all the candidates. MARUAH President cautioned that the Forum was not to endorse any candidature but to raise awareness on the role of the President. Dr Kevin Tan declined to comment but Alex Au proceeded to qualify that all the candidates are honourable men with a clear sense of mission, integrity and personal honour. He only had qualms with regards to what each candidate truly stood for and feels that still needs to be articulated more strongly as it is a question of affinity. People need to feel that their values can be aligned with the candidates. The Role of the CPA was also raised. It was asked that since a President was elected by the people and pre-selected by the PEC with its role prescribed by the Constitution (with grey areas); what is the need of the CPA then. Both speakers agreed with the observations of the participant. MARUAH would like to thank both speakers, and also the attendees for staying throughout the forum. The event was a public awareness initiative by MARUAH and we look forward to planning more of such events in the future. It would not be possible without the continuous support of the public and supporters of MARUAH. This entry was posted on Sunday, August 28th, 2011 at 10:19 pm and is filed under Event reports, PE2011. You can follow any responses to this entry through the RSS 2.0 feed. You can leave a response, or trackback from your own site.